Christmas cake – you either love it or you hate it, right? I’m lucky that my mum makes the best one ever, but I know a lot you probably can’t stand all of that fruit so I’ve come to the rescue with Chocolate Mousse Cake. This half cake half cream-mousse is the perfect alternative to the classic heavy fruit cake and offers you a chance to eat even more chocolate. It’s ridiculously easy, too. 300g plain Lindt chocolate (or alternative chocolate, no more than 40-50 per cent cocoa solids so avoid dark choc for this one) – I used some Lindt bears. Berries (I picked raspberries and blackberries) and icing sugar to decorate. Step One | Preheat your oven to 180C/160C Fan/Gas 4 and line a tin with parchment paper. For the cake: In a bowl, mix the cocoa powder with the water to make a paste, then add all of the dry ingredients then the butter and eggs. Mix until smooth and pour evenly into the cake tin. Bake for 20 minutes in the middle of the oven. Step Two | Once cooked, remove and allow to cool in the tin. For the mousse: Melt the chocolate in the microwave in 20 second bursts or over a pan of water in a bowl, allow to cool slightly. Beat the cream until soft peaks form, then tip the melted chocolate in and combine until glossy and smooth. Tip Three | Smooth the mousse on top so it’s level, cover with cling film and put it in the fridge for a minimum of 4 hours. I left mine overnight and it was fine. 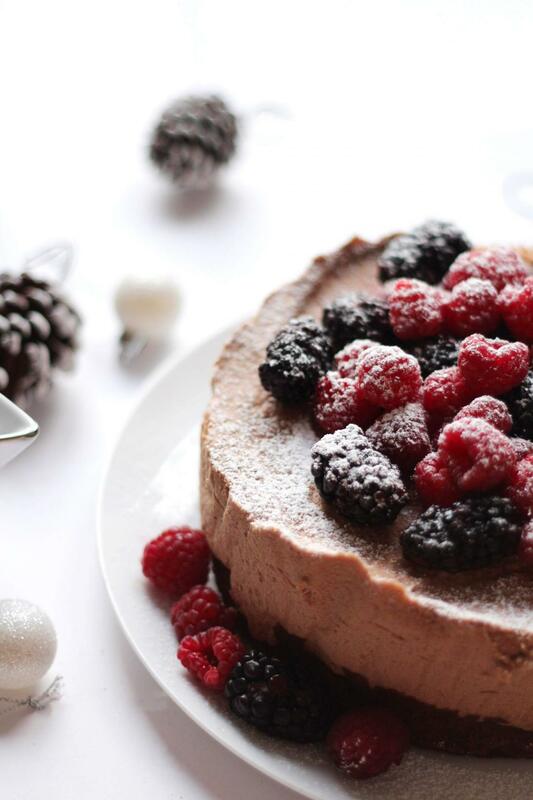 Once firm, transfer to a plate, decorate with the berries and dust with icing sugar. Serve immediately. Using an individual plate is optional, you can just shove your face into it if you like. It’ll keep for two days in the fridge. Aaand there you have it, Chocolate Mousse Cake, it takes literally no time at all in terms of being hands on – maybe 15 minutes at the most? Then boom, an impressive looking cake that isn’t as heavy as it looks so you can have 3 slices no problem. 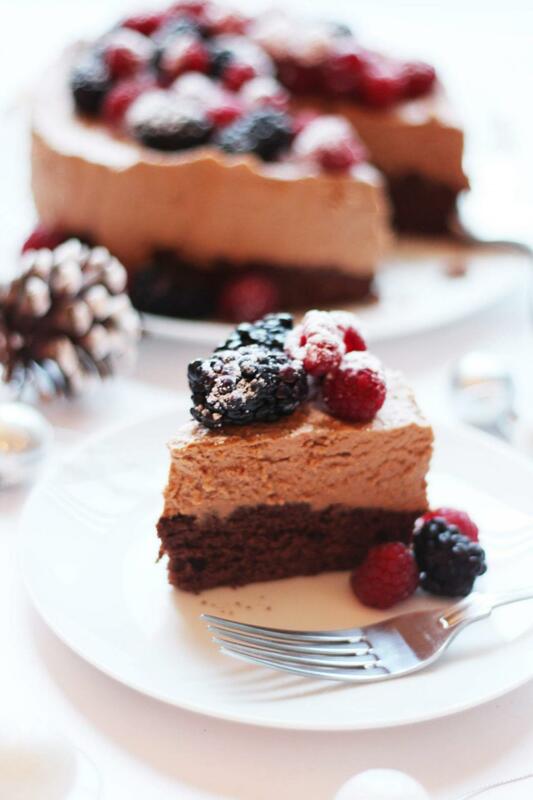 Let me know if you make this Chocolate Mousse Cake or any of my other bakes.